In spite of what they might have hoped, Apple’s and Google’s in-car platforms haven't cpnquered everywhere, as revealed in a report by Venturebeat. If the companies can't get a grasp on the car market in four years of selling their smartphone pairing technology, what will their attempts at creating an electric car that's viable and attractive to customers even look like? Given Amazon's intention to transition their voice-controlled 'Alexa', the digital assistant becoming increasingly popular in domestic use, to use in vehicles, there's a chance that Google and Apple will face further competition on the electric car market. Entering into the competitive world of car manufacturing is a bold move from the tech giants, and with reports of Honda's recent plan to provide a 15 minute charging system for its upcoming electric cars</a>, the competition for Apple and Google's electric cars won't be easy to ignore. Could the big brains and stacks of cash the companies will likely bring to their projects mean an even faster charging time for customers? As charging points for electric cars continue to pop up around the country (and were even seen in the latest season of the dystopian nightmare Black Mirror), it seems that we are preparing for the technology to become the norm. A report by The Guardian evealed that, when it comes to our finances, electricity is certainly cheaper than petrol or diesel, with 100 miles of travel in an electric vehicle costing just £3 to £4. 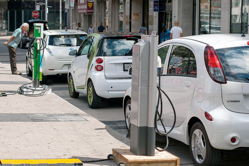 Given the substantially lower price of driving both economically and environmentally, The Guardian article points out that it might just be a matter of time before we're all cruising around in our Google, Apple or even Amazon electric cars. Unfortunately, the average electric car can only travel 150 miles before it needs to be charged, whereas the average full tank of fuel will last drivers 400 to 500 miles without stopping, so the vehicles still have a way to go. Perhaps Apple and Google's genius engineers will be on the case soon, though.